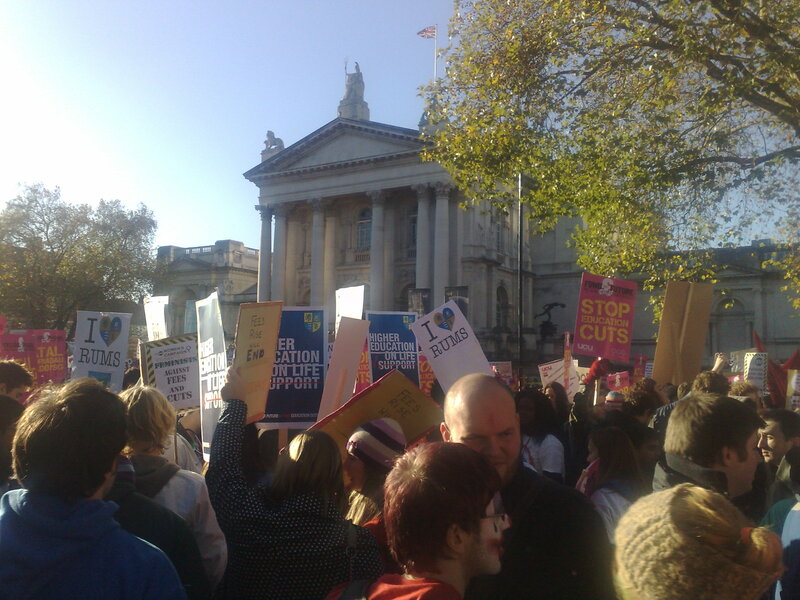 Demo 2010: A mostly peaceful student protest. Having just returned from today’s demonstration in London, I’m shocked but not quite surprised at the media coverage of the event, which is primarily focused on the violence that took place at Millbank Tower. From what I saw, the march was a peaceful one. Arriving a little after the scheduled 11:30 meeting time, I was met by a huge throng of students stretching in all directions along Horse Guards Avenue. After a little help from some stewards, who pointed me towards the students who had come on the behalf of my former university, we stood around chatting, waving flags, and occasionally chanting slogans. We eventually set off towards Parliament, moving slowly, but hollering our slogans passionately. As we passed Parliament, I saw that some students had decided to turn the march into a sit-down, which was nothing out of the ordinary. We then passed Millbank Tower, where a large group of students had gathered, with some protesters entreating us to stand, in solidarity, outside Conservative HQ. This was before anything got out of hand, and before any windows were broken, but ushers were still trying to get people to continue on with their marching. After a while, we came to a halt in front of a large screen erected in front of the Tate Britain. On it, we saw a projection of NUS head honcho, Aaron Porter, shouting about something I was sadly too far from the screen to hear. From there, my small band of protesters I’d been marching with made attempts to double-back on ourselves. However, some were slightly scared by the raucous crowd circulating in the general area surrounding Millbank Tower. As a result, we decided to hang back for a short while, purchase some lunch, and then return to Horse Guards Avenue in greater numbers, joined with others from the same Students’ Union. In a nutshell, that’s what happened, at least to us. A recurring thought amongst my peers was that there was no sense of elation when we reached the end of the march. The crowd petered out, with some protesters going home, and others going to board coaches to transport them back from whence they came. It wasn’t unsatisfying, it was just a little empty. So many Unions from across the country worked tremendously hard, along with the NUS and UCU, to coordinate today’s protest, and for what? There are blogs emerging that advocate necessary action as opposed to “a dour rally like a ticker tape parade for the homecoming queen”, justifying what happened by claiming that some riotous response was to be expected. In my personal opinion, however, what took place was a bit rash. While it is in the interest of students to draw attention, and perhaps make attempts in illustrating their ire towards the proposed fee increases, I don’t think that smashing bricks through car windows, and drawing on walls is the right way to garner such positive attention to our cause, and to bring about change. 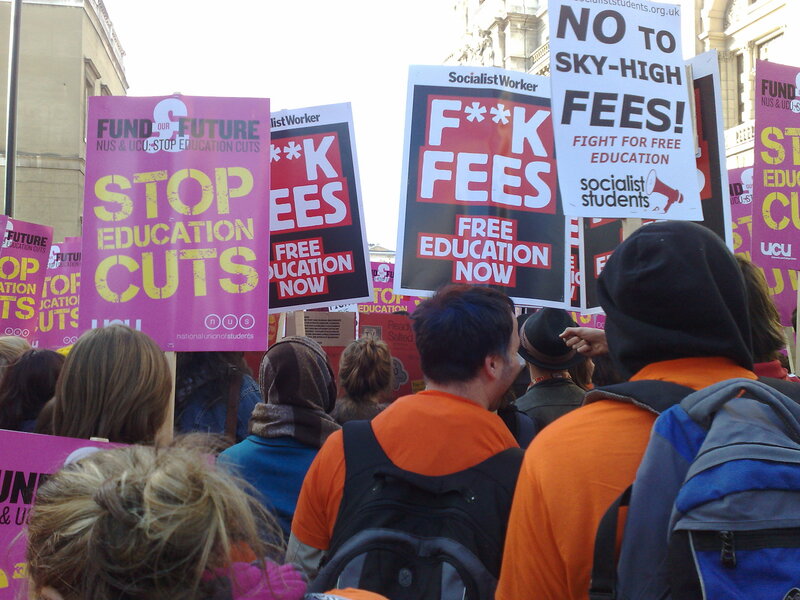 Believe me, I’m as angry as most about the proposed increases, and Nick Clegg’s colossal U-turn on his policy to abolish fees, but I think what happened today went a considerable way to undermining what thousands of well-wishing students set out to achieve. Before you light your torches and get angry, let me explain myself. Most of those (at least in the blogs I’ve read) who claim that what happened at Millbank Tower was a just response, also claim that action on this scale was essential to possibly highlight students as a ‘force to be reckoned with’, who will accept nothing other than a complete reversal on economic policy, and the elimination of these preposterous fee increases. While it is necessary to make a bold statement, with something perhaps greater than a march, there are still a few universal truths we need to remind ourselves of. No matter how much we desecrate his party’s base, David Cameron will still be our Prime Minister at the end of the day. Nick Clegg will also remain our deputy PM, and will be sure to still behave as any other politician would do so in his situation. This is a sad state of affairs, at least on the behalf of students. Still, cry as we might, we are restricted within the confines of a system these men control. Rather than rebelling against it in the extreme, my suggestion is that we play ball. Today’s march was meant to be an exercise in unity; a stand in solidarity to show that we, as students, can stand together, and be angry about spending cuts, and fee increases. However, by staging something like Millbank Tower, all we’re doing is showing the general public (who far outnumber us) that we’re a bunch of hoodlums who can’t follow basic instructions and simple marching etiquette. At the end of the day, it’s their money that will go some way, whatever happens, towards subsidising our degrees. I’d argue that it’s in our best interests to show that as a nation of students, we’re deserving of such subsidies, and ideally, towards a free education. If we had the general public on our side, the government would really be soiling themselves, as today was a chance to make people more powerful than any of us sympathetic to our cause. Sadly, that’s not what happened. Imagine what the news reports would have been like if this would have remained a purely peaceful protest. Like, if any news outlets didn’t have any violent tales to spin out of proportion. I think I’ve made my point already, but please, do ponder this before you go to sleep tonight. What would tomorrow’s headlines have been if Millbank Tower had never happened, and what effect would this have had in rallying positive attention towards our cause? Riddle me that. It’s that time of year where men all around the world make a solemn pledge to grow their facial hair, no matter how embarrassing it may seem. For the uninitiated, Movember is a movement (I don’t use the word lightly) created by the Prostate Cancer Charity, where men (and women!) attract sponsorship to grow (or support someone growing) a moustache for the month. It’s a great deal of fun, and it’s for an excellent cause. Prostate cancer ruins the lives of men, often requiring frequent hospital visits and painful treatment procedures. It also kills one man every hour in the UK. Something clearly needs to be done, and hats need to be tipped towards the Prostate Cancer Charity for creating something so quirky and fun, which people generally want to associate themselves with. It is Sunday 7th. I am well aware of this, but I began my own fundraising efforts yesterday. I did start clean-shaven on the 1st, but for some reason did not document this. Just as well, I suppose, as it wasn’t too pretty. If you’re a man, or a woman, who isn’t involved yet, then I urge you to do so. As with any good cause, raising awareness is a key factor in helping overcome whatever we’re battling. If you haven’t already, head down to the Movember website and sign up, even if it is to post pictures of your barren mug, which is perhaps punctuated by the odd sprout of facial growth. Believe me, you won’t be the only one. Alternatively, click below to view my ‘introduction video’, as it were, where I bumble my way through a somewhat painful shaving experience. You can also visit my Mo Space (the ‘space’, I feel, is somewhat vital to avoid infringing copyright) which I’ve lovingly shortened to bit.ly/moaris. Also, Mo Bros and Mo Sistas, if you are in on it, I’d love to hear your experiences in the comments below. Feel free to share your Mo Space links, too! Well, ladies and gents, this is the start of a wondrous journey for me. It’d really mean a lot to me if you could spread the word about my mo-growing efforts, and of course, to my fellow participants, the favour shall surely be repaid. The best of luck to all of you!